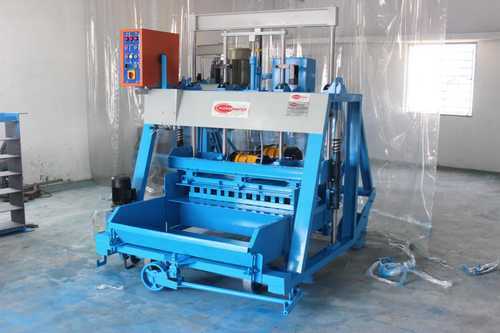 This is hydraulic concrete block making machine an egg laying type hydraulic operated Concrete Solid Block Making Machine on wheels, Which will lay the block on the concrete Floor and move to the next laying. Any type of concrete blocks can be produced with Consistent quality by fixing different types of concrete mould and ram in the machine. Established in 2015, "Everon Industries", has quickly become an industry leader in the area of manufacturing and supplying precision-engineered range of Block and Brick Making Machines. The range of products we offer include Cement Block Making Machines, Fly Ash Brick Making Machines and Mobile Concrete Mixers, among others. Our products meet the most stringent national and international standards and saves time and money in the most practical manner. To sustain our high standing among clientele, we are committed to adapt, innovate and refine our products and processes. We adhere to these principles dutifully and honestly. With regards to our manufacturing process, we only utilise the most cutting edge technology available in the market. It is our utmost priority to sustain close relationships with our clients. This is why we value their feedback to constantly improve our product line. We are committed to complete client satisfaction– one of our teams is assigned to a client to assist with technical support. Our only motto is work tirelessly towards satisfying clients.